"When and if I decide to seduce you, believe me...you'll know." The 1990s saw a dark period in the career of Eddie Murphy. Though he once dominated the silver screen and was easily capable of starring in films that would rake in millions upon millions of dollars, his star power began to weaken with his once heavy-duty comic talent. After Beverly Hills Cop 2, Murphy seemed to want to experiment with his traditional roles. Although a film like Harlem Nights was poorly received, it was definitely a step in a different direction. Boomerang is very much in that same vein, with Murphy trying to do an effective comedy that also showcase a greater depth of talent. Again, we have a piece of work that didn't fare very well critically, but one that I think is underrated and deserving of credit. Boomerang tells the story of Marcus Graham (Murphy), a womanizing professional in the perfume advertising business. Despite his denials to the contrary, he is thoroughly sexist, but to him it's no big deal. His two good friends are sort of the angel and devil of his conscious: Gerard (David Alan Grier) who is shy and respectful of women, and Tyler (Martin Lawrence), an extremely crass womanizer whose laughable, blatant nature makes him quite harmless because he's such a loser. When Marcus' company is taken over by a larger cosmetics firm, he loses his position as head of marketing, and is put under the authority of Jackie Broyer (Robin Givens). Marcus assumes he can charm his way into Jackie's life, but she's much different from any other woman he's encountered. She's just as crass, stubborn, and abusive as he is, only he's never noticed his own faults before; as she steps him through them, he begins to understand just a little of what his effect on women has been. A slight dose of complexity is added to this tale when we follow the doomed relationship between Gerard and Angela (Halle Berry), both of whom are nice people, they're just not compatible with one another. A good portion of the story, though, has nothing to do with all of these relationship issues and is purely injected with comedy, adding a slice-of-life atmosphere to the picture. Scene stealing moments are easily provided by Grace Jones who portrays 'Strangé,' a bizarre, in-your-face fashion model and cosmetics icon who wants Marcus' firm to produce new ad campaigns. On the same token, Geoffrey Holder's all-too-brief performance as Nelson, the extremely twisted conceptualist of commercial campaigns, also serves to distract from the core story. I'll admit that the depth is compromised a bit by the constant comedic elements and Marcus isn't a particularly likeable person as a central figure, but it's entertaining and handled in a very smooth way. Eddie Murphy seems at his better moments when he's surrounded by lots of good talent, and that's certainly true here. Image Transfer Review: The image transfer is good, but will probably strike many people as being soft and grainy, resulting in a slightly "warmed over" picture. Still, the colors are very good and the dark scheme used throughout most of the film isn't ruined by incorrect black level or messy pixelization. No compression artifacts are evident as a distracting element. Audio Transfer Review: The Dolby 5.1 soundtrack offers a very pleasing range of audio effects without really coming off too brash. While the surround channels aren't used very much, except for slight ambience here and there, the front speakers deliver the dialogue and musical score very well and with just the right amount of push. The surround track offers the same elements, only with not quite as much channel separation. Extras Review: A handful of deleted scenes provides a look at some brief material removed from the final cut. Most of the material are extensions to scenes that are already in the film. Some work, some don't, and an optional commentary from director Reginald Hudlin gives insight into why the edits were made. Hudlin's full-length commentary is also worth a listen as a behind-the-scenes look into the development of the film and all sorts of other trivia. It's a fairly relaxed track that is not always scene-specific, but is very relevant. The disc's presentation is fairly basic and the usual for Paramount releases. My one complaint would be the rather few chapter stops. 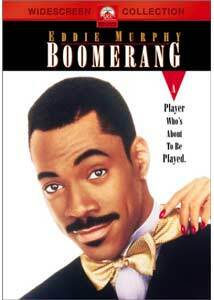 Boomerang is a nice, casual comedy that showcases Eddie Murphy's ability to be effective in a role where he is not the sole focus of the movie. It is not a masterpiece, but it functions much better than similar romantic comedies.